In 100% of the cases of an upload failing it was due to the answers in the Text/Internet section of Vision Data not being filled out as was expected by the processing program on the server side of the feed. 2: in cases of confidential ads; how to keep the advertiser hidden while providing the end user with the needed information. 3: Provide for correct display of the advertisement in the top ads on our websites. Please take a moment to review these details and feel free to contact Glenn Knarr at Ext 8217 or IT Helpdesk at 8200 with any questions you may have. First and MOST IMPORTANT! It is critical that all of the required fields in the Text/Internet section of the ad taking process are filled in completely with the correct information. "NA" or "..." or "asdfghjk" are not acceptable answers to the questions, and will fail your upload, if this is not caught by the people at each of your sites responsible for reviewing the Yahoo upload log that is emailed to them each morning, corrected and then the feed resent... your customer will have paid for an ad that never appeared online. Second: each of the fielded questions have been set to apply the advertisers customer data as the default answers when choosing the "get default answers" button at the bottom of the window. This works well when there is a local advertiser placing an ad for help wanted for their own business. 1: the ad does not ZONE correctly; as the system uses the city state and zip of the job location on their site in order to index it and display it to the end user correctly (ex. search for all nurses within 20 miles of 18503). If the Job LOCATED fields are left to the defaulted advertiser who may be in Texas, the job will never display to users doing a search in their area of interest. You must change this to the physical location of the job itself, if unknown, I would suggest using the hometown related info of the newspaper at least to have it appear in the search related to your products location. 2: The MAIL RESUME fields are also defaulted to the advertisers address, this should be adjusted as well to reflect the true address of the local company the job is with... If the job is confidential, these should be left blank or populated with the address of the Blind box only. 3: Confidential or blind box ads need to be changed as well in order to display correctly online (confidential ads index within the location of the job but do not show information related to the advertiser) all of the above instructions apply as you MUST tell the ad what data it needs to index and display correctly, however you will want to hide the advertiser from the end user. This process is done in TWO STEPS... after all of the required data has been filled in either by hand or using the default answers, you must change the "Company Name" question to "Confidential" by selecting it from the Drop down... this hides all of the advertiser info online... SECOND you MUST have an answer to ALL REQUIRED questions... do not fill them with garbage as the system will spit them back out as it has processing logic that checks for correct city state zip combinations. Please only use the Confidential feature at the customers request. There has been instances in the past few weeks where ads failed because of confidential being selected and other data being set to "NA" or "hkgfhjfdk"... These ads, when brought up for repair, clearly had the advertisers name address and phone number to apply listed in the body copy of the liner? Confidential is only for instances of a specific customer request or a blind box. 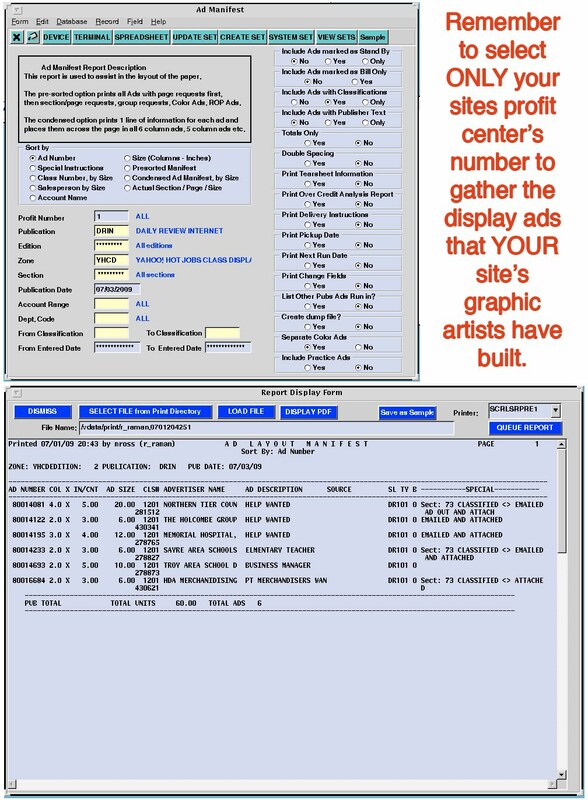 The information applies to both Classified liners and Display ads. 4: Detail information related to other types of "TOP" advertising; when an ad is defined as a Top ad it pulls information from the Text/Internet answers to display itself on our websites automatically. Therefore, if a customer has placed an ad for a car and has chosen the top Cars option, the information in those questions is whats used to display the vehicle online. The Year, Make and Model are extracted from the answers and passed to the website for display. Therefore filling in anything BUT the correct data will display that information on the website directly. It has happened a few times that the link displayed "hjgsadfukyg" or NA NA NA on the website for the ad. still need a primary and a backup designated. These people are responsible to check the report for errors each day, identified in the summary as "Skipped" ads... the ad #'s and reason for not being accepted to publish are included in the details of the report below the summary. It is very important these ads be called up by someone at your location, the errors corrected and the ads re saved. The site must then call IT at x8200 for a resend for their property. (this will be automated in the next few weeks, we will advise you as to when corrections will automatically re post). NOTE: ANY changes in the indexing information (information filled out in the Text prompts) MUST be updated within the first 4 days of the ad appearing online... therefore, it is very important that someone reviews the report on a regular basis. If an ad failed to upload for any other reason it can be resent and the date will not affect it. To Check your ads online you can navigate to a page displaying all ads taken for your newspaper by going to the following links. Click on the date header in the resulting window to sort the ads by the date they were uploaded to Yahoo! This should be the description of what the job is (ex. Line Cook, Nurse, Security Officer... if there is more than one position offered in the ad you can place multiple items in this answer. This is what displays online as the link for the customers ad. From Account or person at the location who would like to be able to log in to Yahoo and change the copy in their ad. Name of the Employer... Defaults to Account data, Ad taker should over strike with the company name if different from account name. If blind box, choose "Confidential" from drop down confidential will hide all data EXCEPT for mail to address, use Blind box address in these questions if Confidential is requested. Job LOCATED in what City? Choose from Drop down required experience in years or select unspecified. FOR DISPLAY ADS ONLY - Type in descriptive text of what the ad contains... this can be as long as you like and should briefly describe what the job is and where it is located. DO NOT FILL THIS IN FOR LINERS! Not required: Where can the applicant email their application to? Not required: Where can they fax their application to? Not required: Does the ad list a web address where the user can fill out an online application or for more information? Not required: Address to mail application to IF CONFIDENTIAL, this should be the address of the blind box at the paper or left blank. the YahooAsura server "IN" folder.